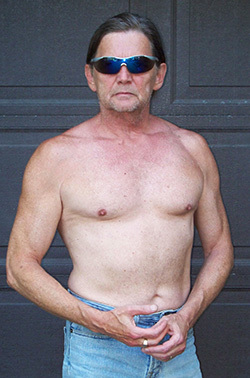 Fitness Publisher Doug Champigny At 57½ Years Old – July 4th, 2012 in Barrie, Ontario, Canada. 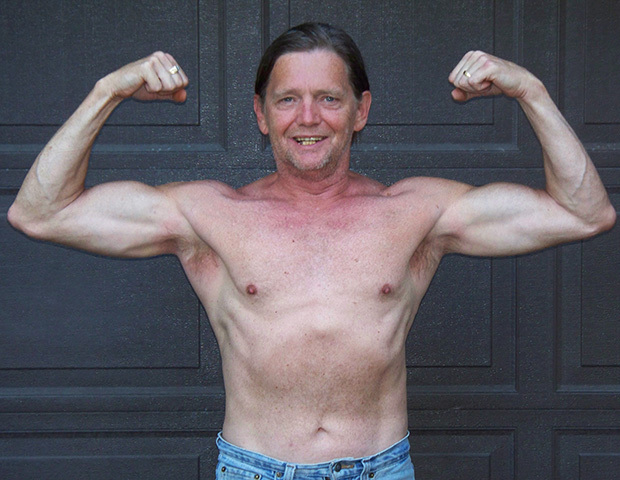 Though I am a certified personal trainer, fitness author and publisher of Flirting With Fitness, the first things you’ll notice from the photos here are that I’m not a hugely-muscled, steroid-abusing meathead – nor am I ‘ripped’ with washboard abs. I will not go near steroids or other ‘performance-enhancing drugs’ because my goals are fitness, health & longevity, not size at any cost including those three. And I don’t sport awesome 6-pack abs because I have no intention of competing anywhere at this point and don’t see a need for them otherwise. That doesn’t mean I don’t admire men & women who have the discipline to achieve a 6-pack or 8-pack, just that I’m not prepared, at this time anyway, to restrict my diet and dehydrate my body to reach that state. BodyProud, Comfortable In My Skin & Ready For The Beach Anytime! While I am most definitely pursuing and living the fitness lifestyle, I’m not about to let that pursuit take over my entire life. My family comes first – and fortunately my wife TC and my son Devon workout with me and follow the same nutrition plan. My only wish is that my daughters Dawn and Tara lived close enough for me to train them as well. Also, like 99% of those reading this blog, I have to earn a living – and a very good living to support our home gym, our healthy eating and supplementation program, daily living expenses and our huge goals & dreams for the future. Just as it’s stupid to ruin your health in the pursuit of money, it’s just as dumb to forego financial gain to focus on that extra 5 pounds of muscle gain or fat loss. As with most things in life you need to strike a healthy balance – you need enough money to eat well, avoid financial stress & do the things and go the places you want in life AND you need the good health and fitness level to be able to do, go to and enjoy those activities. The point I want to make here is that you don’t need massive muscle gain or extremely low bodyfat to enjoy a fit & happy lifestyle, nor do you need to let it take over your life. 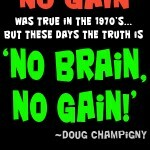 Unless you intend to become a competitive bodybuilder or fitness model, don’t set your goals at either extreme. Not only will you be setting yourself up for disappointment, but you’ll be truly dismayed when you find out what it really takes to STAY in either condition year after year. I don’t recommend you start out with that much exercise if you’re just starting out – we’ve spent 18 months getting back in shape to get to this point and didn’t start out with even half of this time and effort. But even skipping one TV show a day and going for an hour-long walk each morning, noon or night will go a long way towards starting your new fitness lifestyle. And you can upgrade in increments as you’re able and motivated to do as time goes on and as you get into better condition. And we’ll be releasing some training products over time as well, based on all the real-world testing & tracking we’ve been doing and will continue to do as we experiment with various workout routines, exercise styles, nutritional tweaks, etc. Be sure to bookmark this blog and the whole FlirtingWithFitness.com site and visit both regularly for updates. And in the meantime, please be sure to comment and/or ask any questions you have about fitness, working out, nutrition, etc, on this or any other of my blog posts – the comments are moderated, and I’ll answer each legitimate comment or question personally. 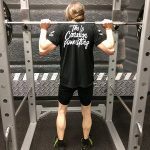 If it’s a question you’d rather not be seen asking publicly you can use my contact page and it may take a day or two but I WILL answer your relevant fitness questions for you as best I can. This entry was posted in The Road To 60 and tagged bodybuilding, exercise, fitness, fitness lifestyle, fitness questions, health, healthy lifestyle, healthy nutrition, nutrition, weight loss, weightlifting. Bookmark the permalink. Doug, happy 57 1/2th birthday! Congratulations on implementing this new fitness regiment in your life. And I do agree with you that overall health and longevity are great goals but 6- and 8-packs are not if they come at the expense of the first two. Thanks so much, Alex – and thanks for stopping by and taking time to comment! With all the hockey & other sports you & your boys play, I’m sure you’ll continue to stay in shape!